Dermot McCabe was born in Bray, Co. Wicklow, Ireland. He straddles both science and the humanities with a degree in English Literature, Philosophy and Archaeology from University College Dublin and a Masters in Applied Electronics from Trinity College Dublin. Following a very successful career in the national radio and television station, RTE, he took early retirement from his position as Head of Broadcast Engineering to follow his love of literature and writing. 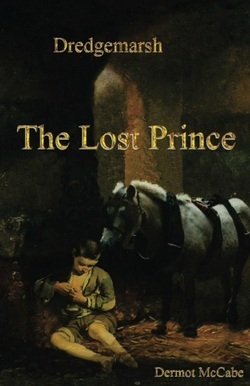 Since then he has published two novels in The Dredgemarsh series: The Reluctant King and The Lost Prince. The third novel in the series will be published in the autumn of 2015. 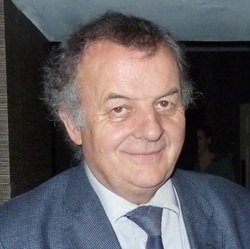 Dermot is one of the founder members of Abraxas Writers. They meet every week in The Strand Hotel, an inspirational location because it was built, as a summer house, by Oscar Wilde's father. That same hotel is within sight of the Martello Tce. where James Joyce lived as a boy. His other keen interests are Music, Art , cycling and walking a family dog, Blake, in the surrounding countryside of Wicklow, The Garden of Ireland. Cesare Greyfell, reluctantly abandons his studies, accedes to the Dredgemarsh throne, on his father's death, and promises that he will be guided by Chancellor Demetrius Tancredi. But, indifferent to his duties, he allows Tancredi to take over. Because of that youthful indifference and distracted by his desire for the beautiful Lucretia Beaufort, he puts his own life in mortal danger. He loses his kingdom. The woman he loves is pledged in marriage to an erstwhile enemy of Dredgemarsh. Defeated, ill and deeply ashamed he retires to the monastery of Anselem where his wounds, both physical and spiritual are healed. He resolves to win back his kingdom and punish those who betrayed him, even Lucretia, who appears to have colluded in his downfall. The Knights of Anselem, though small in number, pledge their support. Incredibly, Cesare learns that, within the the walls of Dredgemarsh, a most unlikely band of insurgents led by the Cook Meister, Lazarus Clutchbolt,, are preparing a revolt against the traitor Tancredi. But, Cesare's plans to win back his kingdom is uncovered by Tancredi and disaster seems inevitable for both him and Lucretia Beaufort. Dredgemarsh is on the cusp of a glorious era of prosperity under the inspirational leadership of Cesare Greyfell. Cesare and his beloved Queen Lucretia await the birth of an heir, the culmination of all their dreams. Tragedy strikes and the hopes and dreams that animated all those loyal to the Greyfell dynasty turn to ashes. The tragic event is compounded by a vicious and traitorous menial, Shoveller Fairgame, with delusions of grandeurs, who finds himself in the extraordinary position of ending the reign of the Greyfells forever. He does not waste his opportunity. Fate presents another terrifying threat when Cawdrult the brutal King of neighbouring Brooderlund assembles an unstoppable army to raze Dredgemarsh to the ground and slaughter all its citizens. 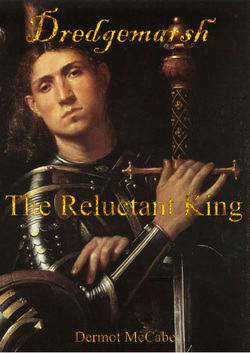 This mesmerising Gothic tale is a continuation of The Reluctant King and like it immerses the reader in the smells, tastes, tears and laughter of a medieval world of intrigue, love, hate and brutality.